Brought up on a diet of new-millennium motoring, it’s easy to forget that a world exists where cars aren’t mass-produced creations designed to suit the demands of the globalised world, created by companies that are either foreign, or long ago forgot how to be British. After nearly a decade of knowing nothing but variations on the small hatchback (sorry, ‘city car’) it would be nice to experience the roads in a different way. 10am. We pull into the yard amid persistent drizzle. One of the signs on the gate gives the first clue as to what might be in store; it’s a pretty safe bet that my girlfriend hasn’t arranged for us to spend my birthday watching kitchens being made in an old farm building. But aside from having to find the paper-half of my driving licence 24-hours previously, the day’s events have so far been kept secret, so the words “Classic Car Hire” serve only to put a smile of anticipation on my face. That smile becomes a wide grin at the sight of an outbuilding full of nine or ten classic cars all parked nose to tail, obediently waiting for someone to take them out on the open road. I’m no walking encyclopaedia when it comes to these sorts of vehicles – anything I see built before about 1980 usually elicits a comment of, “I’d love to drive something like that,” regardless of make, model, style or size. Nevertheless, I can still recognise an old Porsche 911 and a couple of Jaguars – an E-type and a MkII like Inspector Morse drove. 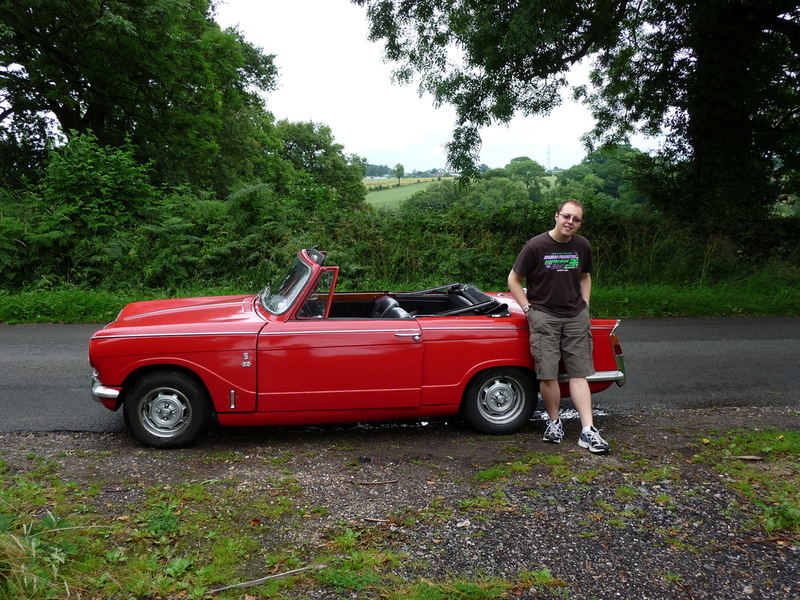 A funky-looking red car with a folding roof sits nearest to us – it’s a Triumph Vitesse, 1968 vintage, and is about to take the honour of being the oldest car I’ve ever driven. I look back down the yard, trying to work out where the course or track is that I’ll be going out on. The surprises haven’t finished yet though. Driving a pre-determined route, it transpires, is not the point of the day. A quick trip up and down the yard for acclimatisation, then we’re sitting in the gateway with the 2-litre engine burbling enthusiastically. It sounds positively delighted as we venture onto the country lanes, despite my trepidation and heightened awareness that the transport is someone else’s valuable property. The feeling of vulnerability, sitting in a car with no ABS or other modern safety features, and built thirty years before Euro NCAP even came into being, is particularly striking. The first time we meet another car is scary, but they allow a respectful amount of room and any potential mishap is quickly averted. Equally quickly, but perhaps most importantly, I soon remember that however alien it might feel, it is still just a car. Even so, no power steering is very alien indeed! Simple junctions suddenly become complex undertakings – in addition to wrestling with the wheel there is a lot of travel in the four-speed gearbox, and finding second gear is, initially at least, more than a little down to pot luck. Then there is the position of the indicator stalk, which seems better suited to a ’25 to 5’ hand position than the more conventional ’10 to 2’. Maybe that hadn’t been invented in 1968. We survive, happily, and eventually head north toward the Peak District. The next challenge is getting up to a speed that matches the other traffic, which at around 40mph requires the use of the stalk just behind the indicator controls – the impressively titled ‘overdrive’. Acting as the fifth cog the gearbox never had, it makes 50/60mph far more achievable, even if my nerves make a stately 30 or 40mph more desirable. With four decades spent on the road, however, the car knows what it is capable of and demands more of its driver. The dramatic styling of the bonnet points the way forward with animal-like purpose and the Vitesse growls along, happily eating up the miles as I feel ever more at home behind a dashboard mercifully free of cheap plastic. It’s also a mechanically simple machine, and you can’t help but feel particularly cruel any time a pothole is unsuccessfully avoided. The seats are far comfier than those in my own car and, with the freedom to go absolutely anywhere, the day sees nearly 150-miles go by without a hint of fidgeting. When your right foot makes all the noise you could want to hear, lack of a radio is inconsequential. 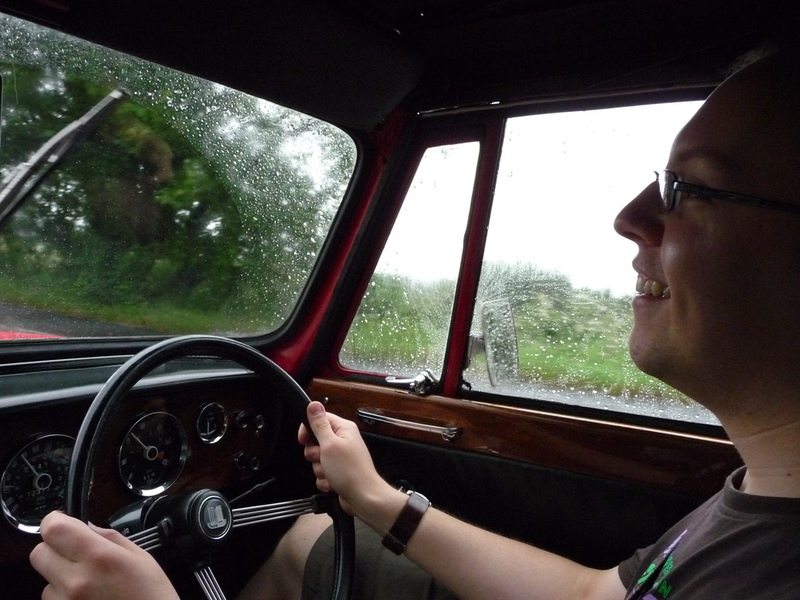 As is the roof’s … inconsistent … ‘weather-tightness’ – even the trickle of water down my right leg, thanks to some particularly severe rainstorms, fails to dilute my enjoyment of the drive. That enjoyment reaches a whole new level in the afternoon. The roof goes down almost the moment the sun comes out and we head straight back to the winding lanes. 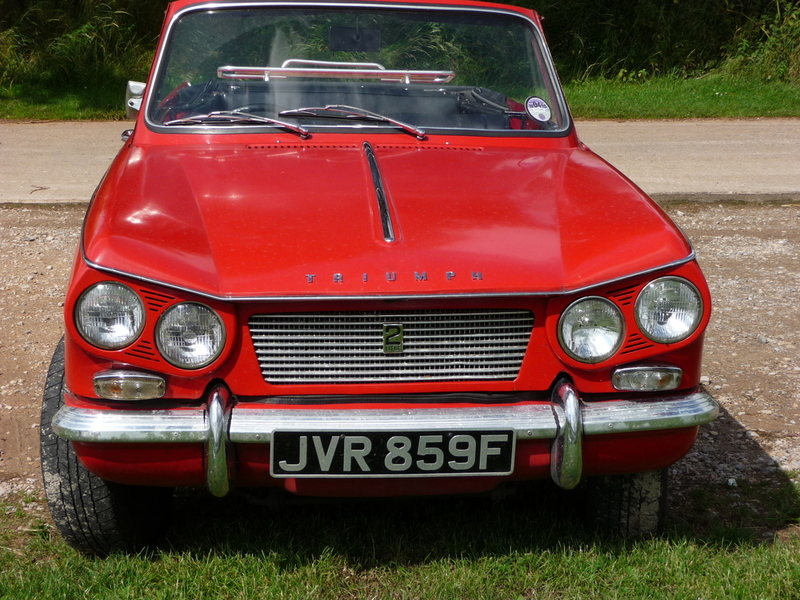 The Triumph revels in its natural habitat; drivers in other cars glance at us with envy (much like I would do if the roles were reversed) and I can’t help but feel a swell of pride. The experience doesn’t fail to live up to the utopia that comes to mind when seeing other people driving their classics. Anything the Vitesse might lack (by modern standards) in refinement it more than makes up for with charm. Compared to the sanitised journeys that most of us know and have come to tolerate on our daily commute, this is motoring as it should be; how it was envisaged when no one could conceive of congested town centres, gridlocked motorways and a worldwide preoccupation with Global Warming. 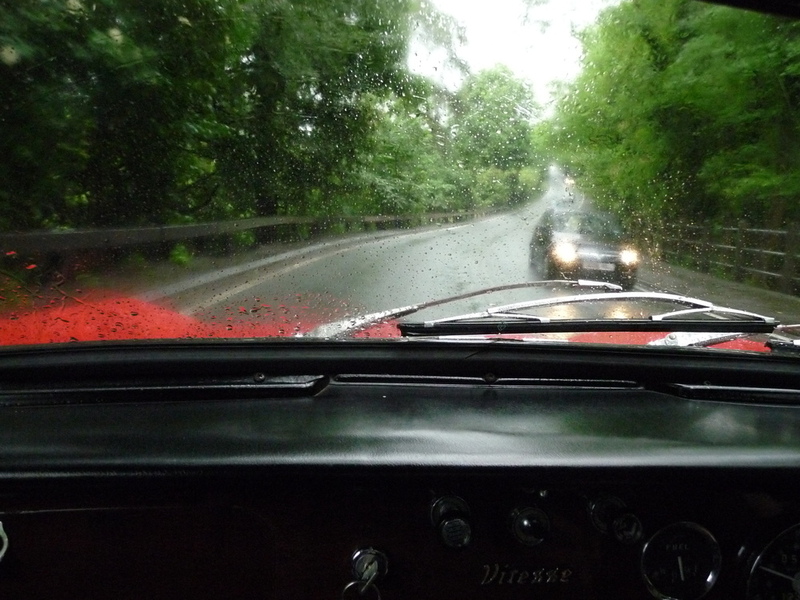 In one day I’ve experienced the quirks and the thrill, the rain and the sun, of driving a classic, all without having to own one. After today, maybe that will be my next step because I was wrong earlier – the Triumph is so much more than just another car.